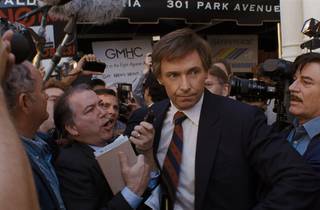 Hugh Jackman plays Gary Hart, a US presidential candidate sunk by scandal, in a film more interested in media machinations than betrayal. There’s an aggrieved moralist at the heart of director Jason Reitman’s movies, but on his better days, he doesn’t give in whole-hog to that inner prude. He sits down with him, savouring a tension that, in turn, supplies ‘Juno’, ‘Young Adult’ and Reitman’s recent ‘Tully’ with a complex sense of empathy. 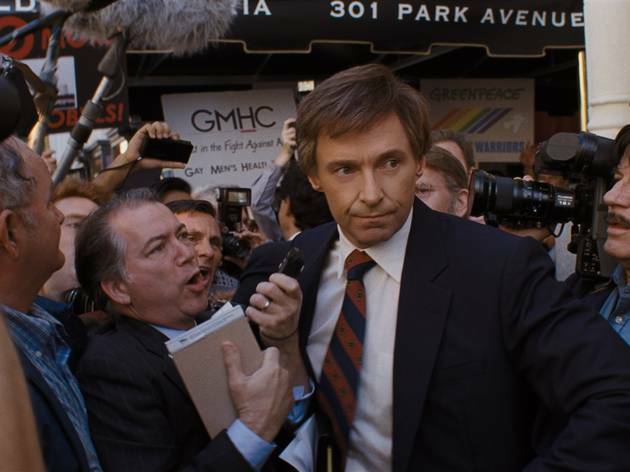 ‘The Front Runner’, about presidential candidate Gary Hart (a mostly plaid-and-denim-clad Hugh Jackman, pinned down by an underwritten role) and his spectacular fall from grace in 1987 after a much-publicised marital infidelity, looks to return Reitman to the political territory of his savage feature debut, ‘Thank You for Smoking’. But in a post-Trump world, the script – based on Matt Bai’s 2014 account – feels like it’s trying too hard to flatter us: Can you believe the kind of scandals we once got so cranky about? That glibness, subtle yet unavoidable, is misplaced. The film is so desperate to come off like a wry, coffee-stained media satire that it misses the deeper story, that of a woman being treated shabbily on a man’s way to the top. Was that not timely enough? You wait for Vera Farmiga to unleash a magnificent monologue behind closed doors, the one that presumably lured her to the role of Hart’s wife, Lee, in the first place. But it never comes. ‘The only thing that I asked is that you don’t embarrass me,’ she says, almost gently. The Front Runner has more patience for poor Donna Rice (Sara Paxton), dragged through the mud, than for articulating Hart’s arrogance toward Lee, even in private moments between husband and wife. And if there’s a point at which Hart realised he had to withdraw from the race, a flash of personal reckoning or guilt, it’s not included. Reitman is strong while swirling the media circus, depicting reporters like schlubs and leaning on the effortless cynicism of his gruff-voiced regular, JK Simmons, who plays Hart’s campaign manager caught unprepared for the onslaught. Recently, it’s been credibly reported that the whole Hart scandal was an elaborate set-up orchestrated by the vicious Republican operative Lee Atwater. None of that is in the film either, and while you can’t hold breaking news against The Front Runner, there’s a whiff of inconsequence to Reitman’s take, fizzy and watchable though it is. It should be about the stealth weaponisation of outrage (and of women) – a tragedy that’s leagues more sophisticated than this. This is all about the moment that American Politics changed. The American Press & media after decades of allowing Politicians to live private lives without exposing their personal flaws, suddenly decided that they were fair game. Hugh Jackman plays the Presidential "Front Runner" Gary Hart, who believes that his Political skills & visions are all the media needs to know, and they have no business looking into his private life. A pretty spot-on review from TimeOut. A slow and meandering recreation of events that is enjoyable as it goes - but there is too much that is lacking, not least more about 'the wife' (Vera Farmiga's talents are under-used), and more about why Hart decided to throw in the towel (after at first coming out fighting). Entirely neglected too is the possibility (widely reported since) that the whole thing might have been a Republican set-up/sting - it was only a decade on from Watergate after all. But such tantalising dramatic ambiguity is lacking. This could have been Oscar material - but instead it's just ok. A shame really.